Now, your responsibility is higher than that of playing all of the music correctly and pretty. It’s time to “run your section.” You, more than likely, have the largest section of the band. Let’s find out what it takes to pull all those folks together. Some high school directors and/or colleges require weekly sectionals run by the clarinet section leaders. Directors that require this probably also give you tips on what to musical areas in the band or orchestral music to “cover” in sectionals. If they do not, first of all, they are not helping you guide your section to success, and second, you are in the right place to get ideas about how to run a clarinet sectional. This is an informational page on how to get the most out of your section. Become active in Clarinet-Now.com 2.0, if you run your section or have ideas on how to run a clarinet sectional, share them with the world here. If you are a band director and have your students run sectionals, tell the world how you structure or ask them to do it right here. 1. Act like a clarinet section leader, see this page on Clarinet Leadership. Run your section. 2. Show up on time – set-up the chairs and stands. Ask for help in preparing the room. 3. Start on time and prepared (Have a Plan) – start simply – focus on small, trouble spots in the music – if you have no idea where to start, play all-the-way through the music. At trouble spots, stop the section and go over the rough patches. Another way to look at clarinet section leader responsibilities is to become a “musical psychic.” Predict the trouble spots of your section in the music and try to fix them before your director. Yippie, another Clarinet-Now.com list. What are clarinet section leader expectations from the members of your section? 1. During band rehearsal, lightly mark trouble measures in the music that you hear from the clarinet section. Make these the focus of your sectionals. 2. Use your own practice techniques to help improve the section. Do you change articulations to make working on technique more interesting (as a practice technique, not changing the articulations permanently)? Do you slow measures down to half speed to work out technical problems? Do this with your group, play through the measures extremely slowly and/or work sections out in loops. Show your section members how to practice. (You do not have to “talk-down” or “yell” at your section to get a point across. Simply try some rehearsal techniques and say, “this helps me when I practice” or “Wow, that sounds better now,” after you’ve completed a successful sectional). 3. Know your parts. Demonstrate the “how” in sectionals. If you do not know your parts, the expectations of the section members knowing their parts will diminish. Lead the way. 4. Know the other parts, sometimes the 2nd and 3rd parts can have more difficult licks than the 1st and solo parts. Do you have to practice every single measure of every single 2nd or 3rd part? No, but look over them enough to suggest alternate fingerings or guess tough intonation spots. Giving your section members an easier finger combination will make you a hero. 5. Keep your clarinet sectional efficient. People like being productive and not wasting time. Have fun, but keep the pace of the sectional fast. Try to keep gossip and rumors to a minimum. Try to stick to the business of making and improving the music. 6. If playing music with a difficult key signature; play through that scale with the section. Tuning by ear is the best. However, many people use electronic tuners. Use these as a guide and tool. Don’t stick a tuner in the face of a section member and say “play.” Try this, you look at the tuner, have the person play…. And hold the note. Stop the note and let them know where they lie (20 cents sharp, etc… or not). Have them pull out and play again. Let them know if it improved or not. Typically, the clarinet section leader sticks a tuner in a person's face and they adjust their mouth and make the needle, LED light or strobe fit right in tune. Will they adjust their mouth every time when that note arrives? Probably not. Try this during your personal practice time - get a true reading of your pitch. Close your eyes and play a note (at least a whole note before you open your eyes). Open your eyes and check the tuner. Now adjust the length of your instrument. Why close your eyes? If you stare at a tuner, your tendency is to adjust your embouchure immediate to make the needle, strobe or LED light move to the center of pitch. It is best for you to close your eyes and find you true pitch (flat, correct or sharp) so you can adjust (or not adjust) the length of the instrument. Find that place where you are both playing in tune and neither have to adjust to lips. Try this with other notes on the instrument. Every clarinet has different tuning tendencies. Make a tuning chart for yourself to get your instrument’s tuning tendencies. Now, take the experience and work it with your clarinet section. Here's how to settle the “I’m right” argument with tuning in CLARINET SECTIONAL. You are standing in front of your clarinet section and are running the sectional. The section is REALLY out of tune. Stop the group and take two members (Clarinetist A and Clarinetist B) at a time. Make them play a note - let’s use open G. Point at Clarinetist A and say, “you hold the note stable and point at the second (Clarinetist B) – you adjust to the other.” Ask what that person did? Lip up, lip down, how much or how little? Now, reverse this. Have Clarinetist B hold the note stable and Clarinetist A adjust to Clarinetist B. Once you do this drill, each clarinetist has an idea of where to adjust with the pitch. Now, ask them to play the note and adjust to each other. Hopefully the pitch is better. You have just trained two of your members on how to play in-tune and adjust to each other. Now, it’s time to run this drill efficiently through the rest of the section. Sound like a long involved process? Yes, initially it is. However, the more you do it (let’s say at the beginning of each sectional), the more efficient you will become in managing the section’s pitch and the members will acquire more correct “pitch” skill (also known as ear training). The goal of improving your ears as well as the ears of your section does nothing but improve your “musical leadership.” Pitch is relative. Tuning correctly with each other is the “team” goal. By knowing these drills and acting on them, you are becoming a GREAT clarinet section leader. AS THE CLARINET SECTION LEADER, WHAT ARE THE BENEFITS TO RUNNING CLARINET SECTIONALS? CLARINET SECTIONALS HELP YOU KNOW WHETHER MUSIC INSTRUCTION IS IN YOUR FUTURE OR NOT. a. Think about this -- You practiced clarinet and possibly took private clarinet lessons to improve your skills (you went above and beyond your peers). b. You won an audition based on this knowledge and experience. You became the 1st chair clarinetist. c.	Then, you understood that the difference between first chair clarinet and clarinet section leader was leadership. d.	You developed all the above skills (or enough to improve the section) to run your section well while continuing to practice and keep up your craft. First of all, you do not have to accomplish all the above suggestions in a day, week or month. If you were to try to do this in a really short time, you might even turn people off to the idea of sectionals. However, if you accomplish a good bit, consider taking your section beyond the band music. 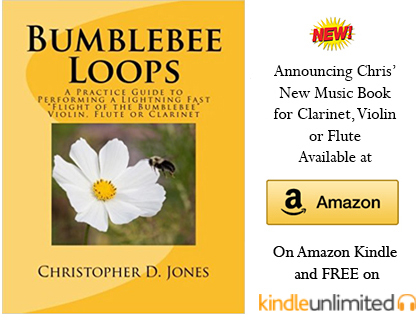 Find clarinet trios, quartets and clarinet choir pieces to read through. Maybe, assuming the section is excited enough about it, you can feature the group on a concert with you as leader. Your band director will eat this up. They will hope that your model as clarinet section leader will spread to the other sections. “First rule of leadership: everything is your fault.” Hopper from A Bug’s Life. The clarinet section leader more than likely will lead the largest section of your band. Who are the critics of your section? Can they run it better? Surprise them during the sectional, if you see bored members huffing, rolling their eyes, not agreeing with your musical standards, etc… Say, “Suzy Q., will you run these measures in this piece?” This will wake them up and two responses occur: Yes or no. No – They are horrified at standing in front of the group. They will respect the fact that you are doing it. Yes - They will stand in front of the group. They will experience the pressure and either perform well or not. A greater respect for leaders often comes with acting as leaders. Someday, you will be gone and who will run the section then? Might as well get some experience in the ranks. Basically, you are training the future section leaders of the clarinet section. Some very, quiet, unsuspecting musicians “light-up” when asked to “run the section.” Will you discover their talent? Good leaders recognize good leaders. What happens if you are not the 1st chair player? What kind of musical leadership can you contribute in this stage of your musical career? Musical career – everyone has to start somewhere with a career. A career does not have to mean your designated job for the rest of your life. You can have a student’s musical career. Some students start playing an instrument in fifth grade and stop in sixth grade. That is a short musical career; nevertheless, it is a career. Let me tell you a secret, a majority of those with the short musical career wish they stuck to it. I’ve had this conversation with many, many, many adults: “Oh, yeah, I played clarinet in sixth grade, but I quit because I didn’t like the band director. It was stupid of me at the time and I really wish I knew how to play or read music now.” Whatever the reason for quitting music, people usually regret the decision later in life. Listening to music is great but creating it is just plain AWESOME. Okay, we are off track. Now, how can you contribute as a musical leader if you are not 1st chair? In the world of leadership, it is commonly known that “the best leaders are the best followers.” If you follow correctly and honestly, you will listen to your clarinet section leader and do what they tell you. Learn from this person and why are they making first chair. Understand how they practice and try to find out how long they practice every day. Do they take private clarinet lessons? Get the name of their teacher and go for taking private clarinet lessons. However, if you gather that knowledge and do not practice, you will hang in approximately the same chair (or worse) you already made. As you read the bottom of every Clarinet-Now.com page, notice the notable quote of Kalmen Opperman, “Practice and hope, but never hope more than you practice.” What is your ratio of practicing as compared to hoping you play clarinet well? What are your Clarinet Sectional Secrets? What do you rehearse in clarinet sectionals? Do you tune first? Do you focus on starting and stopping together? Who conducts the sectional? Do you work well together as a team or bicker the whole time? Do you have a picture to add? Great! Click the button and find it on your computer. Then select it. If you are in the middle of a sectional need a breather, tell the group to gather and say "Cheese!" Viola,clarinet sectional photo.